Should You Choose Dentures or Dental Implants Bellmore? Patients who are fully edentulous (without teeth) have relied on dentures to replace missing teeth for decades. Advances in dental technology offer these patients an alternative to traditional dentures: implant supported dental prosthetics. 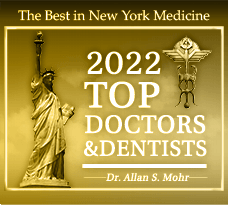 Each option has its benefits, and the only way to know for sure which is right for your individual case is to schedule a consultation with the 5-star New York dentist, Dr. Allan S. Mohr. 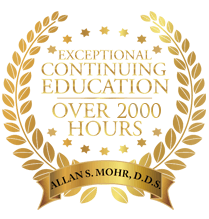 During a dental consultation, Dr. Mohr and his team thoroughly examine your smile, and offer personalized recommendations for optimal tooth replacement success. 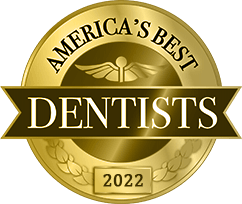 At the end of the day, the decision to replace teeth with dentures or dental implants, is a personal one, but our team provides the necessary information for patients to make a decision they feel confident in. Traditional dentures are made of replacement teeth that adhere to a gum-like base. Suction between the base and gum tissue provides stability for the dental prosthetic. Dentures restore patients’ smiles, ability to eat a wide variety of foods, and help retain facial shape. Traditional dentures need to be removed for cleaning and while patients sleep, but otherwise, can be worn throughout the day. Implant supported dentures can be removable or permanent. A dental prosthetic comprised of replacement teeth and a gum colored base similar to traditional dentures is connected to implant posts. Dental implants are made from titanium, and mimic the function of the tooth roots. The dental prosthetic can be attached to the implant post with permanent abutments connected by the dentist, or using ball or bar connectors that can be removed by patients at home for cleaning and during sleep but still provide the added stability of a dental implant. Because implant supported dentures replace the entire tooth from roots up, patients enjoy the added benefit of retaining bone and gum tissue lost without the necessary stimulation from the roots of teeth. Additionally, patients who choose permanent denture placement can maintain regular oral hygiene, and don’t need to remove teeth for cleaning overnight. Patients who currently wear dentures can even have their existing prosthetic altered to connect with dental implants saving time and money. 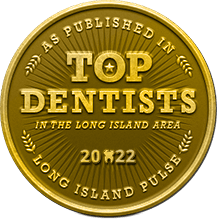 If you’re interested in finding out more about tooth replacement options in Bellmore, Massapequa Park, and beyond, contact Dr. Mohr and his outstanding team to schedule a consultation today. Our team is happy to help you explore your smile restoration options, so you leave our office with a smile you’re proud to share. by: allanmohr at November 24, 2015 .